The first half of the Alekhine Memorial in Paris has come to its end and now the players will move to St. Petersburg to continue the fight on April 28th. Over the past four days we've had a tight group of leaders. 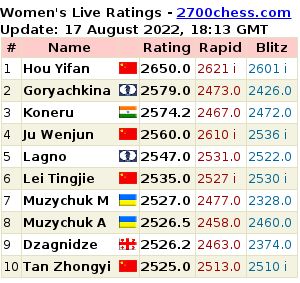 However, towards the end, only one of them managed to break forth, and that is the French GM Maxime Vachier-Lagrave. We asked GM Alexey Dreev to comment on Vachier-Lagrave's winning game over Peter Svidler. "We have witnessed one of the rare high level games in which the opponents chose to play 1.d4 Nf6 2.c4 g6 3.f3 e6!? It seems that the variation becomes popular, so it's not ruled out that we will see more of such games in the future. How can Black's a bit odd 3rd move be explained? First of all, not everyone who plays Grunfeld wants to go for the Samisch variation in the King's Indian. In general, there only few of players who are equally good at playing the Grunfeld and the King's Indian with Black. The structure after 3...d5 4.cxd5 Nxd5 5.e4 also won't suit everyone (let me remind you that there is a game Kramnik - Shirov from the Candidates match in 1998 that evolved similarly; it can be said that due to Kramnik the chess world started to pay close attention to the move 3.f3). So, the players are just trying to deviate from the theory and create an interesting play. It's clear that Svidler has prepared for this game, since one of those two games played with this variation and available in the database belongs to Vachier-Lagrave (who had Black against Vitiugov). 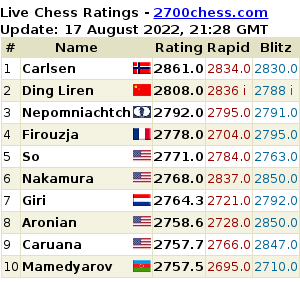 You should also keep in mind that Nikita was Peter's second at the recent Candidates tournament. After 4.е4 d5 Vitiugov played 5.е5, while Svidler chose another continuation: 5.cxd5. And his preparation worked here - White got some advantage, but then something happened- something, that may happen to any other player and even to a such high level player as Svidler. 21.dxc5? A mistake based on a wrong evaluation of the position. 21...Rhf8 22.Qe5+?! The continuation of the same mistake. Perhaps, Peter was sure that the endgame would be more comfortable for White this way, otherwise why not play 22.Qc2 ? Now let's get back to the 21st move. First, White should have checked 21.Qf4+! and after 21...Ka8 22.dxc5 the black bishop is under threat, which means White wins a very important tempo. In this case, White perhaps still could have fought for the advantage. 24.c6 Rd2 25.Rf5 Bd6 26.Nd7+ Kc8 27.Nf6? This mistake leaves White no chance to escape. Vachier-Lagrave used his opponent's mistakes skillfully, so we can hardly doubt that this victory was deserved." Peter Svidler wasn't the only one to lose in Round 5. Both Vladimir Kramnik and Ding Liren lost for the second time in the tournament: the first one was defeated by another French GM Fressinet, while the latter could not resist the World Champion. Watch all the games of the round. Е.SUROV: It's 20.43 MSK time and we're live on Chess-News, the sixth round games of the EICC are underway in Legnica and now one of the winners of this round Maxime Vachier-Lagrave will join us. Today he smashed Sergey Volkov in less than two hours. So, please tell us what happened in your game?